Est. 275 bhp, 2,492 cc SOHC air-cooled horizontally opposed six-cylinder engine with Bosch mechanical fuel injection, sliding throttle bodies, and a twin-plug ignition, five-speed manual transmission, independent front and rear suspension with anti-roll bars, and front and rear disc brakes. Wheelbase: 2,268 mm. Competition has always been in Porsche’s bloodstream, and the company thrived on circuit racing and hill climbs from the outset. Whilst its mid-engined spyders became known as “giant-killers” everywhere from Sebring to Le Mans, its bread-and-butter rear-engined production chassis offered a distinct advantage on tight and twisting hill climb roads. Strangely, the company’s racing department had shown relatively little interest in rallying, although Peter Falk and Herbert Linge drove a new 911 Coupé to 5th place and a class victory in the 1965 Rally Monte Carlo, which was the 911’s initial foray into the international rally arena. Then, a British racing driver named Vic Elford persuaded the factory to lend him a 911 to race in the Monte Carlo Rally in 1968. With David Stone navigating, and with minimal backing from the racing department, Elford skilfully drove his 911 T to an overall win in the opening event of that season’s FIA World Rally Championship. Adding some frosting to the celebratory cake was the 2nd place finish of Pauli Toivonen and M. Tiukkanen in a 911 S Coupé. 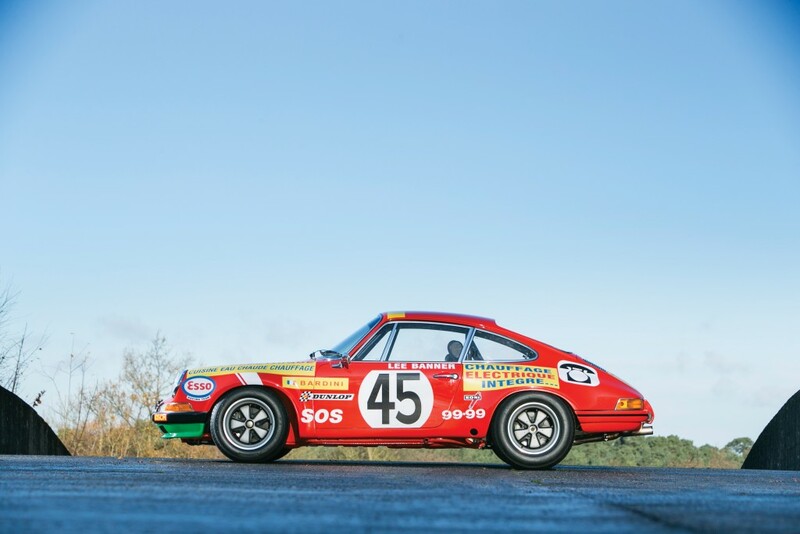 For the 1969 season, Porsche was convinced that the 911 could be a contender, and it prepared an even half-dozen new 911 S Coupés for rally duty. Chassis numbers 119300529, 0530, 0548, 0912, 0931, and 0932 were pulled from the assembly line for preparation. 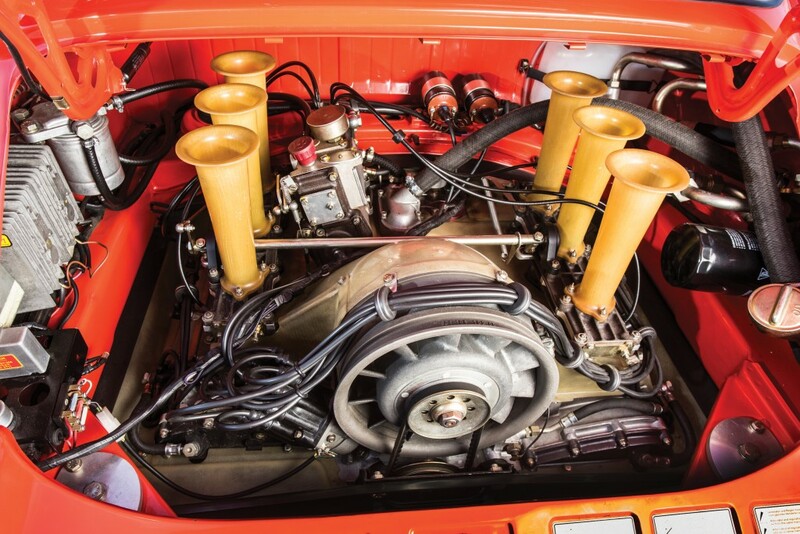 All would be fitted with carefully built Type 911/30 engines that were equipped with Bosch mechanical fuel injection. Chassis and suspension parts were strengthened, lighter-weight aluminium doors were fitted, and all of the usual modifications were made to help these cars and their occupants withstand the worst road and weather conditions. Chassis number 119300932, the last of this group, is offered here. Former factory driver and Porsche expert Jürgen Barth confirms that this car was delivered from Zuffenhausen on 18 March 1969 and was painted 6809 Blutorange (Tangerine) with a black leatherette interior; although, at this time, it did not have an engine or transaxle. This car, along with the five others, was transferred to the racing department for completion. 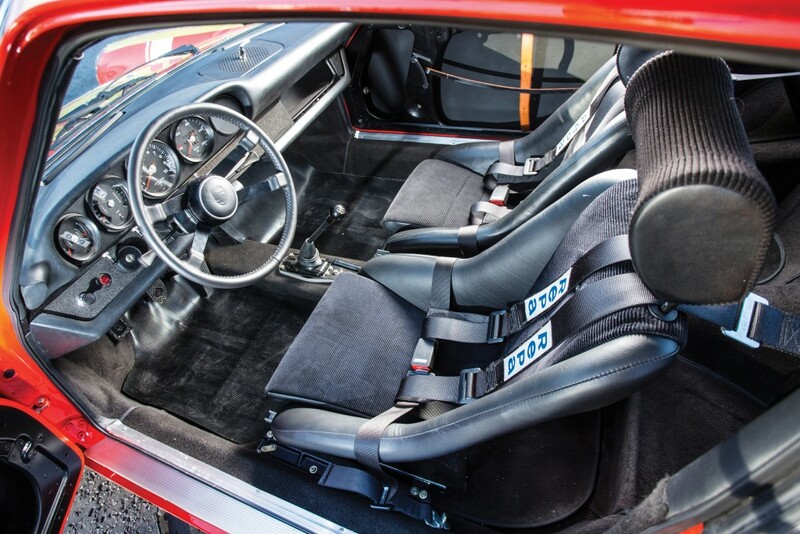 A Scheel racing seat was installed for the driver, along with a leatherette and cloth Scheel seat with a headrest for the navigator, and competition-type lap and shoulder harness sets were added for both. The interior was otherwise quite spartan, with most trim pieces and noise-absorbing insulation removed to save weight. Rubber hold-downs ensured that the front lid would stay firmly in place. There was a much-larger-than-standard windscreen washer reservoir, and the back-light had electric heating. A special 100-litre fuel tank was also installed. The front disc brakes were upgraded with experimental callipers and non-standard pistons, whilst the rear discs remained standard. Underneath, there was a 14-millimetre front anti-roll bar and a 16-millimetre rear bar. Barth notes that the engine was tuned to deliver about 170 horsepower, with modifications including polished intake ports, a higher compression ratio, different camshafts, Bosch mechanical fuel injection with sliding throttle bodies, platinum-tipped sparkplugs to prevent fouling at low engine speeds, a special exhaust system, a lightened flywheel, free venting of the dry-sump oil tank, a special generator, and special spark plug boots. The transmission was a standard-production Type 901 five-speed with lowered gear ratios. The clutch package included competition linings, and a ZF limited-slip differential was fitted. 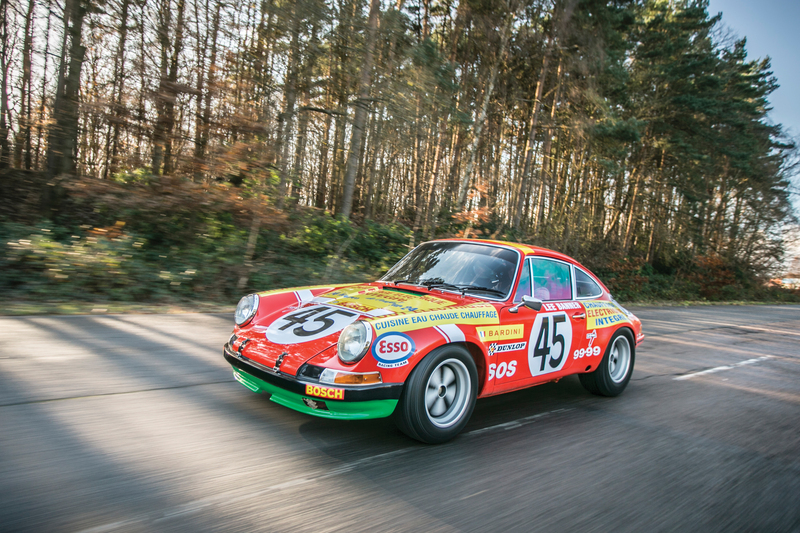 When completed, these rally-spec 911s scaled approximately 2,249 pounds dry. Chassis 0932 was destined for the Acropolis Rally, where it was manned by Pauli Toivonen and Martti Colari and supported by the factory as a two-litre entrant. With a dominate performance, they would go on to win the rally an outstanding one minute and thirty-two seconds ahead of the 2nd place car. After its stint with the Works team, the 911 was returned to Porsche and subsequently sold to its first private owner, French racing driver Jean Claude Lagniez, of Montrouge. At this time, the factory Kardex was updated to reflect the engine number 6390010. Lagniez, with co-driver “Econ” Parot, entered the 1969 Tour de France on 18 September, with the car wearing #126; however, they failed to finish. They were more successful at the 1000 KM of Paris on 12 October, as they finished 16th overall and 3rd in the GT 2.0 class. Lagniez and Delporte partnered to finish 2nd in the Rally Jeanne d’Arc on 18–19 October 1969. The following month, Lagniez and Huret finished 15th overall at the Rally Tour de Corse, and two weeks later, the pair ran the Rally Criterium de Cevennes. Lagniez then sold 0932 to another Frenchman, then retired veteran driver Marcel Balsa, who occasionally rented out cars from his stable. At the time, the car was registered for the road in France with plate number 7793 HG 78. Mr Balsa would send the car to Le Mans in 1970, where it wore #62 and was driven by Pierre Mauroy and René Mazzia. According to the Le Mans scrutineering forms, the Porsche appeared at Le Mans with a 2.2-litre engine. 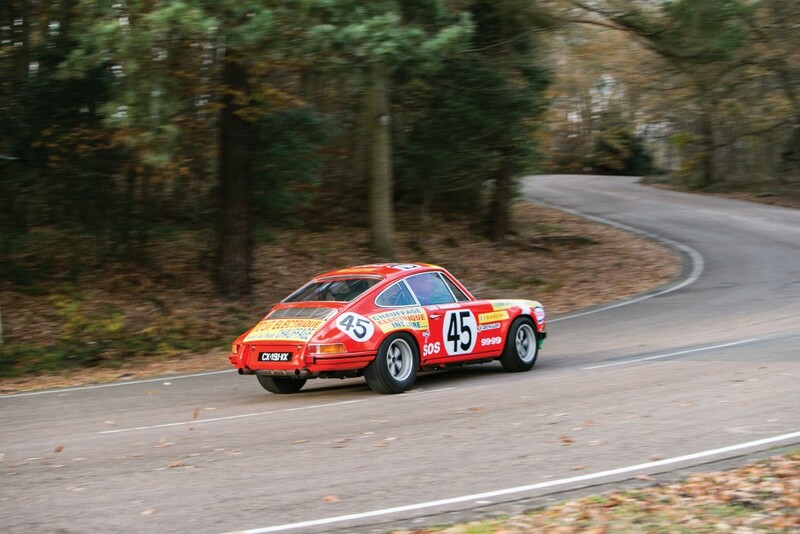 Although the 911 managed to finish the gruelling 24-hour race, it was not within 70 percent of the winning distance, and therefore, it did not classify. Mauroy then bought the car from Balsa, and after partnering with its former owner, Lagniez, he ran Le Mans again in 1971, but this time wearing #37. Unfortunately, the gearbox failed in the seventh hour and the car did not finish. In late September 1971, the 911 was entered in the Tour de France (wearing #130), with Migault/Perramont/Jalott co-driving, and after competing at the Nürburgring and Reims circuits, it finished 14th overall. This 911 S made its final attempt at Le Mans in 1972, where it featured an increase in displacement to 2.5 litres and was driven by Dominique Bardini, “Lee Banner” (Fernand Tsaropoulos), and Raymond Touroul. Again, another valiant attempt resulted in a DNF, as there was an engine issue in the 17th hour. Following Le Mans, Tsaropoulos purchased the veteran racing car before it was acquired by Raymond Touroul in 1975. In 1988, it then passed to Gilles Bochand and two subsequent French owners. Subsequently, it was comprehensively restored and fitted with an original factory engine that had the desirable Bosch slide-throttle mechanical fuel injection and Schrick camshafts. Fire System: Are You Doing It Right? ← Previous Post: Nice Wheels Bro!